New Melones Lake is currently holding 594,573 acre-feet of water. The lake level came up nine feet this past week and will continue to rise with the recent and upcoming rainfall. It is currently at 877 ft. above sea level and 206 ft. from full. The water clarity is clear in most of the lake with a slight stain in some areas. There is a small amount of debris floating on the surface. The water temperature is cooling, with the average being 52-55 degrees. THE CONCRETE RAMP ON GLORY HOLE POINT IS OPEN!! The lake has finally turned over and the surface temperature is cool enough for the trout to be holding up top. Many areas of the lake you can find planted trout and holdover trout cruising up top and feeding on the surface. The trout can be found on the main lake, but many will prefer protected pockets and creek channels. 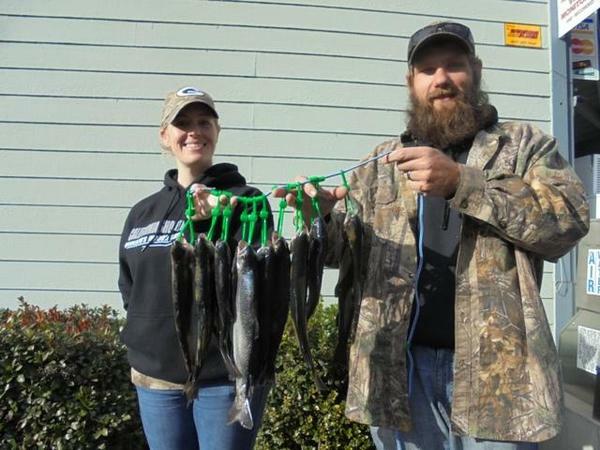 Trolling anglers are finding success top-lining and fishing with leadcore line. Floating Rapalas in both bright and natural colors have been producing limits of fish. Be sure to let out plenty of line. Most anglers will top-line with 150' to 200' of line out behind the boat. Spoons have also been a good choice for both trolling and casting. The Hot Ticket Spoons made by Excel have a very natural finish and work great for trolling. Kastmasters, Cleos and Krocodiles are all good choices for casting. Keep your bait close to the surface and use a reel, twitch retrieve. Bank anglers are starting to pick up a few limits. Soaking Power Bait, mallows and crawlers is always a good approach. Use light line and light wire hooks. It is very important to have your bait float up off the bottom. Check your presentation near the shoreline to ensure it is floating before making each cast. If it sinks add more bait or use a worm blower to inflate your crawler. As your bait sits, use casting lures to cover water and find aggressively feeding fish. Glory Hole Point and the 49-Bridge area have been good locations to find fish from the shore. We do encourage catch and release of brown trout, as there does not seem to be a large population of them in the lake. Carefully measure, weigh and photograph trophy fish and send us pictures and information. With the water temperature cooling, the bass have transitioned into a winter-like pattern. 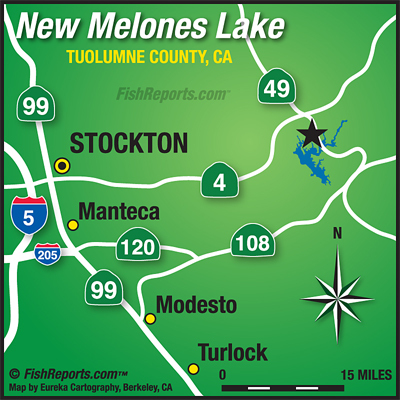 The spotted bass in New Melones are extremely healthy and have been gorging for months. There are plenty of 2 to 4-pound spots to be caught and the possible world record fish is still out there. Some anglers are catching big largemouth as well. A few fish can be found in shallow water, but most of the fish will be holding out in deeper water. A large population of shad will be holding in creek channels and that is another good area to look for feeding fish during the colder months. The fish that are in shallow water will generally move up to feed and then move back out deep to digest. Split-shotting a straight tail worm is a great way to find feeding fish that are holding tight to the bank. There are many ways to catch fish that are holding out deep. Bottom bouncing baits can be effectively fished in 35'-55' of water to catch some chunky fish. 1/2oz and 3/4oz football jigs are a great choice. Also, try using shakeyhead when fishing thick cover and darthead when fishing rocky areas. Vertical fishing is another very effective technique for cold water bass fishing. A dropshot rig is a go-to presentation and can be found on the deck of most anglers boats. A vertical presentation that is often over looked is a spoon. The spoon bite has been good throughout the fall and will get better as the water temperature cools. Switching between gold and chrome spoons is a good way to find what the fish want. In low light conditions gold is generally best and when the sky is bright, chrome seems to shine. Large trout patterned swimbaits can be used to catch some giant fish during the winter months and into the spring. PLEASE PRACTICE CATCH AND RELEASE. Take photos and carefully release the fish back into to the lake to maintain a healthy fish population for generations to come. Fishing for catfish during the winter months is usually pretty slow. Some large fish are caught at this time each year, but not many. It is best to use a ball of Power Bait or Float a crawler. This way you will have a chance to catch both trout and catfish. For specially targeting giant cats, try using a whole mackerel with a double hook rig. These fish tend to hibernate during the cold months and will only move to eat a substantial meal.